What do you call your professional status? Are you a freelancer? Self-employed? A solopreneur? Is there a difference? And, more importantly, does what you call yourself make a difference to your clients? Well, that’s a lot of questions. But, don’t worry, I have a lot of answers for you. Let’s start with the client question. As independent professionals, we spend a lot of time figuring out who our ideal clients are. We create profiles for them. We dismiss them if they don’t meet our requirements. But are they judging us the same way? Short answer: yes. What you call yourself can make a difference. Want a longer answer on how personal labels can alter client perception? Read on. Legally speaking, when you’re self-employed, your clients have a say in the final results of your services/products, but not how you work/produce. In other words: you’re your own boss. No one controls you. You’re an independent contractor and proud of it. If you’ve ever filled out a 1099 at tax time, this is most likely the box you checked to describe how you came about your yearly earnings. This is the term the government prefers to use when talking about a single worker with no on-going employer. Unfortunately, the “self-employed” label is often looked upon as a euphemism for unemployed. Let’s face it: employment rates aren’t what they used to be. This has made people more than a little skeptical about any labels outside of the typical 9-to-5 careers. This is the big one. Whether they chose the life or stumbled into it, more and more people are becoming freelancers. Data from the most recent U.S. census shows experts predicting “that freelance businesses will grow by 1.5 million in 2014” with no signs of slowing down. For better or worse, “freelancer” is the most well-known (and oldest) label for independent workers of the three terms we’re looking at today. Freelancers typically work from home, for more than one client at a time, and have a flexible self-enforced work schedule. Designers and writers are the most likely to call themselves freelancers; however, anyone with a marketable skill who works for themselves can fall into this category. But there’s a disheartening misconception in some circles that freelancers work for free. Another writer noted that “freelancers have a reputation of being amateurs.” Ouch. The term solopreneur is fairly new — so new there isn’t a traditionally published dictionary definition for it — but its meaning is almost intuitively simple: an entrepreneur who goes it alone. These individuals are typically small business owners, business consultants, or other highly business-minded people such as virtual assistants, copywriters, and online developers. They’re either entrepreneurs in the traditional sense — creating something from nothing — or they use the label as a way to stand out from the crowd. Solopreneurs have got entrepreneurial spirit in spades and it seems to be working in their favor. 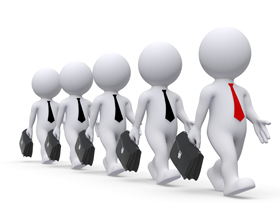 Recent studies have shown that solopreneurs are exceptionally skilled at marketing and delegating. They’re also happier and earn higher wages than their “freelance” or “self-employed” counterparts. While solopreneurs do tend to gain confidence from their entrepreneurial mindset — and, therefore, increased benefits — the label isn’t “intuitive” to everyone. More traditionally-minded clients may give you a raised eyebrow and a “What did you say?” when you tell them your employment status. The solopreneur label is new and relatively unheard of outside of, well, the people who are solopreneurs. As a budding solo professional, you may find yourself facing a lack of respect among old-school clients. No matter which label you prefer, we’re all the same. Freelancers, solopreneurs, and the self-employed are all hard-working individuals with the best bosses ever: themselves. In the end, it’s all about you. How you choose to present yourself to your clients, how you handle yourself in the face of rejection, whether you choose to break through the negative stereotypes or succumb to them all comes down to you. How your potential clients perceive you — whether or not they take you seriously — is entirely up to you and you alone. Commit to it. No matter what you decide to call yourself — say it with confidence! It’s all about attitude. Practice your elevator pitch. Psyche yourself out in the mirror before cold-calling. Do whatever it takes to get your game face on. Call yourself by your other title. You know the one. The one that describes what you do, rather than how you’re employed. “Writer,” “artist,” “software developer.” It doesn’t automatically tell clients who’s the boss in the relationship (you), but you can get that nailed down after you make the sale. Impress them first, bang out the details later. Know your target market. What you call yourself doesn’t matter nearly as much as what your clients call you. What are they looking for? Are they typing “freelancer” into Google? Or are they looking for you via some other term? If you’re not sure, the easiest way to find out is to ask. When a new client comes to you, ask them how they found you. It’s that simple. Don’t get defensive. If someone questions your employment status, don’t freak out. If you start back-pedaling, they’ll have even more questions. Stay calm and explain what it is you do and — even better! — how it benefits them. Be consistent. Once you decide what you want to be called, stick with it. Freelancer, solopreneur, and self-employed are more-or-less interchangeable, but that’s no reason to use them all at once. Rather than covering all your bases, you’ll just end up confusing people. Pick your favorite. Take it seriously. You’re a business now. Act like it. If you take yourself seriously, your potential clients will too. You’ll also be setting a good example for other freelancers/solopreneurs/self-employed workers — helping to quash some of those negative stereotypes floating around out there! Misconceptions about the Internet. At our core, we’re all business owners; so why aren’t we getting the same respect traditional entrepreneurs receive? It can be hard for certain clients to transfer the respect they have for brick-and-mortar businesses to something less tangible (online businesses) even if they’re equally valid. Proving that our businesses are “real” — even if we lack a walk-in office — can be difficult. It’s too easy to start (and even easier to quit). Now that anyone can slap together a website and call themselves a “business,” it can be hard for clients to tell who actually means business and who’s just trying out the lifestyle as a hobby before moving onto the next big thing. This sudden influx of non-professionals into the professional marketplace has made it harder for those of us who are in it for the long haul to be taken seriously. Jealousy. When you were stuck in your cubicle, weren’t you envious of people who were making it on their own? Put yourself in your client’s shoes. If they’re still running in the rat race, they may have some subconscious hostility toward you and your (let’s admit it) awesome lifestyle. Whether you’re self-employed, a freelancer, or a solopreneur; how you conduct yourself is more important than what you call yourself. Always be a professional. And, hey, we’re all in this together! Let’s make each other look good.